I was organizing my bookshelves and notice I have two copies of The Handmaid's Tale, one with my penciled annotations and underlines and another that looks as though it was never read. Since The Handmaid's Tale is one of my favorite Atwoods, I decided to give the clean copy away. 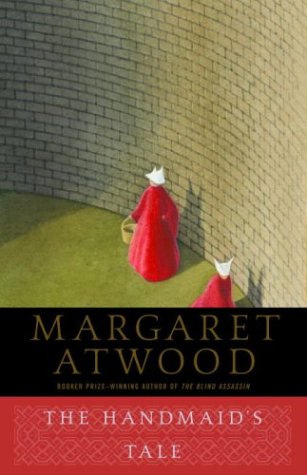 The Handmaid's Tale was the first Margaret Atwood novel I read and I think it's a really good one to start with. So, if you haven't read this book and would like a copy sent you way, just leave a comment and be sure to include an email address. Blurb from Goodreads: Offred is a Handmaid in the Republic of Gilead. She may leave the home of the Commander and his wife once a day to walk to food markets whose signs are now pictures instead of words because women are no longer allowed to read. She must lie on her back once a month and pray that the Commander makes her pregnant, because in an age of declining fertility, Offred and the other Handmaids are valued only if their ovaries are viable. Offred can remember the years before, when she lived and made love with her husband, Luke; when she played with and protected her daughter; when she had a job, money of her own, and access to knowledge. But all of that is gone now... Funny, unexpected, horrifying, and altogether convincing, The Handmaid's Tale is at once scathing satire, dire warning, and tour de force. This giveaway is limited to US and Canadian residents only. I'll announce the winner Tuesday, January 17th. Great book. I read it in highschool (many years ago now), and loved it! I too read it in high school- I have no clue why I don't own it, but would love to! I love this book! I have a copy, so I posted a link to your giveaway on my blog. I hope that's okay. I've heard so much about this book but have yet to read ANY Atwood. Shame on me. Oh, I would love to read this. Count me in for the giveaway. My email is lorrenrichelleATgmailDOTcom. I've somehow missed reading this one over the years. I would love to win it. My email address is reahandedlibrarian(at)gmail(dot)com. I've been told by too many people to count that it's a crime I have not yet read this book. So here, if I win it, I will read it. (My own version of if you build it, they will come.) Here's hoping! broche.fabian(at)gmail(dot)com. Thanks for hosting this! Would love to re-read this, and I have no idea where my copy got to... probably lent it to someone who never returned it. ofabookworm AT gmail DOT com. Wow, thanks for the giveaway, this is an amazing book! This one seems to be everyone's favourite Atwood book. I need more (any!?) Atwood in my life - would love to win this. GregoryRzimmerman (at) Gmail (dot) com. Thanks for the give-away, Brenna! This was my first and favorite Atwood. I loaned it out, and never saw it again. I would love to have a new copy for my shelves! Thanks for the chance! Gotta love giveaways! I've never read Margaret Atwood before but this would be a great start! You can contact me at smedora@umail.iu.edu Thanks!